The current automated weeding machines use cameras to detect plants, and a computer algorithm to process the image, calculate which plants to keep/remove, and activate a kill mechanism. These machines are capable of cultivating within the seedline and removing weeds that would otherwise be left by traditional cultivation. The machines used in these studies included the Robovator, F Poulsen Engineering Aps, Hvalsø, Denmark and Steketee IC Weeder, the Netherlands. Both of these machines use a split knife that as it moves through the field, closes in the seedline to remove unwanted plants and then opens around the desirable ‘keeper' plants leaving halo of uncultivated soil around the crop plants. Both cultivators were designed for use in transplanted crops in Europe. In three of the evaluations the machines were used following thinning of the lettuce. On average the automated weeders reduced the lettuce stand by 5.6%. This may be due to incidental damage from the knives opening or closing at the wrong time due to small plant size. This type of damage can be managed by adjustments on the machine that affect the aggressiveness of the blades. On average, intelligent cultivators removed 51.4% of the weeds in the seedlines and reduced follow up hand weeding in the fields by 37.1%. Mechanical weeding technology has developed significantly over the past several years and, in these studies, provided useful levels of weed control, reducing the amount of time to remove all weeds from lettuce production fields. Most lettuce in the Salinas Valley is direct seeded and thinned by labor crews with hoes. Recently labor available for lettuce thinning has become scarcer. Starting in 2013 and 2014 we have seen automated lettuce thinners become well established in the Salinas Valley. These machines use a camera to capture images of the seedline. A computer analyzes the image and calculates which plants to keep. The computer then activates a “kill mechanism” to remove the unwanted lettuce plants. Four of the five lettuce thinners use a spray solution to kill unwanted plants and one uses a mechanical blade. In just the short time that these machines have been in use we have seen improvements in their speed and accuracy. Intelligent cultivators have been developed in Europe and have been used there for several years. They were developed there for use primarily on transplanted vegetable crops. The current technology in use by these weeders cannot effectively distinguish weeds from crop plants. Rather the machines rely on the difference in size of the crop vs the weeds, as well as the location of the crop plant in the seedline to distinguish between the crop and weeds. The machines use an algorithm based on pattern recognition of the seedline. Plants of specified size in the seedline are assumed to be crops. Basically the machine images a two dimensional plane and views each plant as a blob of green and makes its distinctions based on that image. That is why the machines work more effectively on transplanted crops where there is initially a large difference between the transplanted vegetable and the emerging weeds. Weed plants that overlap with the image of crop plants will also not be detected. In 2015 two intelligent cultivators were available in the Salinas Valley: the Robovator, F Poulsen Engineering Aps, Denmark (Photo 1) and Steketee IC Weeder, the Netherlands (Photo 2). Both of these machines use a split knife weed removal mechanism (Photo 3). This knife travels in the uncultivated seedline that is left by traditional cultivation (Photo 4). It closes between crop plants and undercuts the weeds there. It opens around the crop plants. 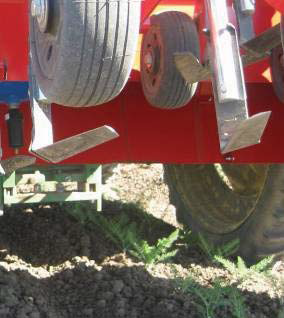 The level of aggressiveness of the machine can be adjusted by allowing the knives to get close to the crop and remove as many weeds as possible without damage to the crop (Photo 5). 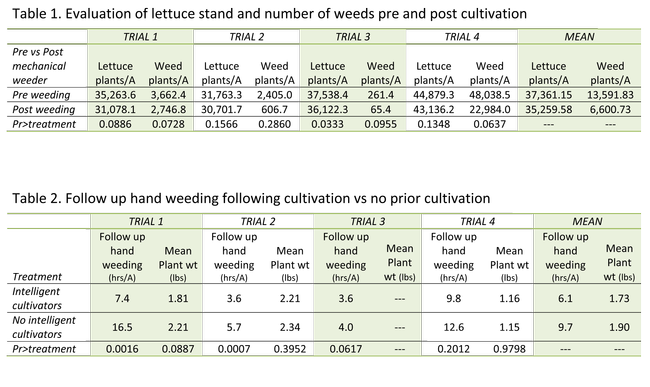 We conducted four evaluations of intelligent cultivators in 2015 to evaluate weed removal efficacy and safety to lettuce plants. All trials were conducted in commercial lettuce fields, and the plantings varied by planting configurations, weed pressure and lettuce variety. 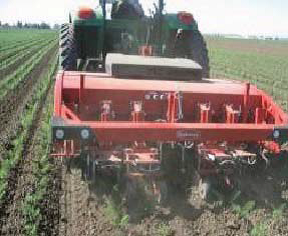 The Robovator was used in three of the studies and the Steketee IC Weeder in one. 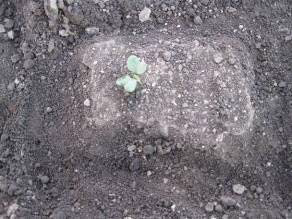 Pre cultivation counts were made of lettuce plants and weeds and post cultivation counts were made of the same parameters one to four days following cultivation. Sample areas where counts were made consisted of two 40-inch or one 80-inch wide beds by 30 to 100 feet long. Sample areas were compared with paired strips that were not cultivated to compare the safety of the intelligent cultivator and their efficacy in removing weeds in the seedline and thereby reducing subsequent hand weeding time. Trial No. 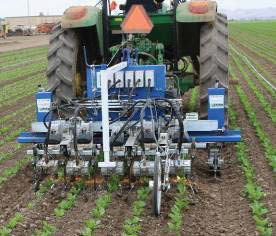 1: This trial utilized the Robovator intelligent cultivator and was conducted south of Salinas in a commercial head lettuce field following thinning. The field was planted on 80 inch wide beds with 6 seedlines. The field was thinned with an automated thinner that used an herbicide to kill unwanted lettuce plants and weeds, however the automated thinner performed poorly and there was a great deal of regrowth of the treated lettuce plants. Weed and lettuce plant counts were made on June 24, 2015 by counting weeds and lettuce plants in each seedline in three replicated 100-foot strips in the fi eld. The field was weeded with the Robovator on June 25. Post weed and lettuce stand counts were made on July 1 by counting surviving weeds, lettuce plants and regrowing lettuce plants in the same area as the pre weeding evaluation areas. The Robovator treated plots were paired with adjacent beds that were hand weeded. Lettuce regrowth, follow up hand weeding time and yield were evaluated in cultivated and non-cultivated plots. Hand weeding evaluations were made by timing how long it took to weed the individual seedlines in each 100-foot sample area. Trial No. 2: This trial utilized the IC Steketee intelligent cultivator and was conducted west of Castroville in a commercial head lettuce field following thinning. Pre cultivation counts of lettuce and weeds were made on July 14 in three replicated 100-foot long sample areas of two 40-inch wide beds with 2 seedlines per bed. Cultivated plots were paired with 100-foot long sample areas that were hand weeded. On July 15, following mechanical weeding, the number of weeds and lettuce plants were counted, and the time to do follow up weeding recorded. Harvest evaluations were made on August 12. Trial No. 3: This trial utilized the Robovator intelligent cultivators. This trial was conducted north-west of Salinas in a commercial head lettuce field following thinning. Pre cultivation lettuce and weed counts were made on July 20 in three replicated 100-foot long strips of an 80-inch wide bed with 5 seedlines. The plots were cultivated with the Robovator. Cultivated plots were paired with 100-foot long sample areas that were hand weeded. 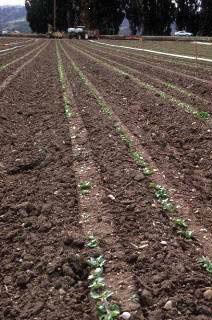 Following cultivation, weeds and lettuce plants were counted on July 21. Time to hand weed the cultivated and non-cultivated plots was measured on July 21. No harvest evaluation was made at this site. Trial No. 4: This trial utilized the Robovator intelligent cultivators. The trial was conducted north of San Juan Bautista in a commercial transplanted organic romaine lettuce field. Pre cultivation lettuce and weed counts were made on August 6 in three replicated 30-foot long strips of an 80-inch wide bed with 6 seedlines. The plots were cultivated with the Robovator. Cultivated plots were paired with 30-foot long sample areas that were hand weeded. Following cultivation, weeds and lettuce plants were counted on August 7. Time to hand weed the mechanically treated and untreated plots was measured on August 7. Harvest evaluations were made on September 4. Trial No. 1: This trial had some problems which made mechanical weeding difficult. There was a great deal of regrowth of lettuce plants from the mechanical thinning operation that did not completely kill lettuce seedlings. Most of these unthinned lettuce plants were stunted, but the Robovator was able to distinguish them from the larger keeper plants, and as a result, removed a great deal of them. There were 64,004 regrowth lettuce plants/A prior to passing through the field with the Robovator and 11,775 regrowth lettuce plants/A after the Robovator passed through the field, an 81.6% reduction. There were fewer weeds following weeding with the Robovator, but there were also fewer of the desired keeper lettuce plants following weeding with the Robovator at this site (Table 1). Overall, there was a dramatic reduction in the number of hours to do the follow up weeding operation following the Robovator: 7.4 vs 16.5 hrs/A (P>0.0016). Another issue that may have reduced the effectiveness of the Robovator at this site was the evenness of the speed of the tractor. For some reason the tractor could not maintain a constant speed which made it difficult for the Robovator to work effectively and may have contributed to some of the issues with the automated weed removal encountered at this site. Trial No. 2: There was no significant difference in the number of lettuce plants between cultivated and hand weeded plots at this site. There was also no statistical difference in the number of weeds removed by the automatic lettuce thinner but there was a trend showing a 74.7% reduction. Follow up hand weeding time was significantly reduced 36.8% after the use of the Robovator. There was no significant difference in the mean head weight between Robovator and hand weeded plots. Trial No. 3: There were significantly fewer lettuce plants in the mechanically weeded plots. Although there were very low numbers of weeds at this site, there was a strong trend indicating that the intelligent cultivators removed 74.9% of the weeds in the plots and it took significantly less time to do follow up hand weeding in the cultivated plots. No yield evaluation was carried out at this site. Trial No. 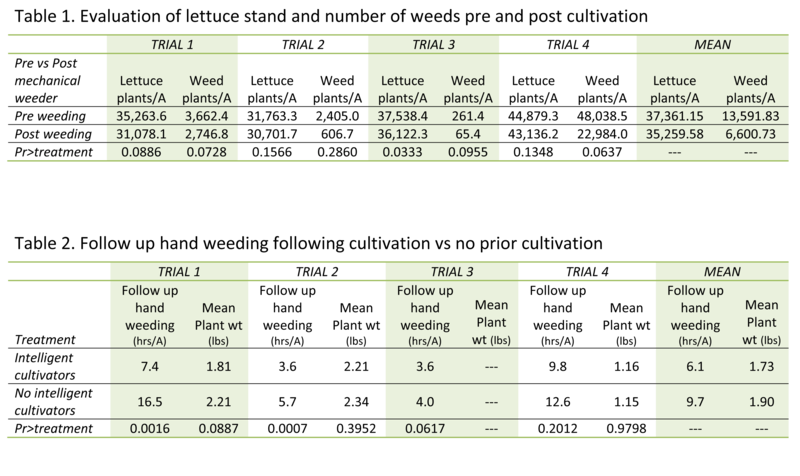 4: There was no significant difference in the number of lettuce plants between cultivated and hand weeded plots. There were 52.1% fewer weed plants in the mechanically weeded plots than hand weeded plots, and it took 22.2% less time to do follow up hand weeding of the plots.